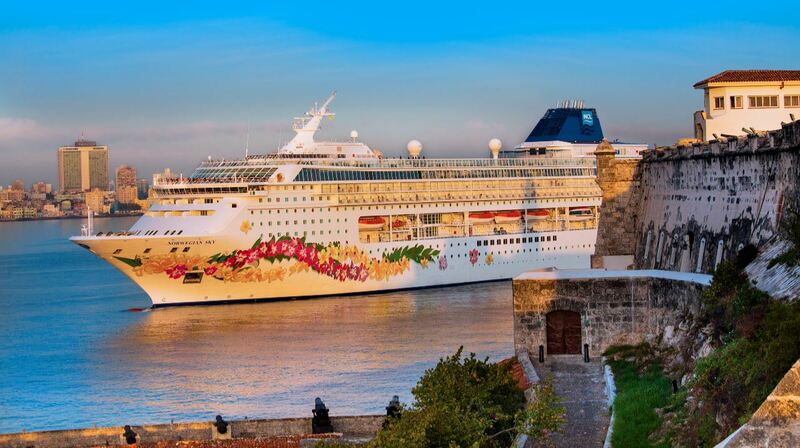 Yesterday marked a historic day in the history of Norwegian Cruise Line as Norwegian Sky made her maiden call to the city of Havanna on the first of her weekly roundtrip cruises from Miami to Cuba. Norwegian Sky, Norwegian Cruise Line’s first ship to sail to Cuba, made her maiden call in the capital city of Havana yesterday morning. Norwegian Cruise Line executives, including Norwegian Cruise Line Holdings President & CEO Frank Del Rio and Norwegian Cruise Line President & CEO Andy Stuart, were onboard to celebrate the voyage. Today’s call was the first of Norwegian Sky’s weekly roundtrip cruises from Miami to Cuba. The ship will sail a total of 53 four-day voyages to Cuba, with 52 including an overnight stay in the historical and culturally-rich capital of Havana. Norwegian Sky will bring guests to the very heart of Havana, offering guests the opportunity to visit historical sites such as Old Havana, a UNESCO World Heritage Site, view incredible art and listen to the vibrant local music scene, and visit with Cuba’s warm and friendly residents. Norwegian offers a selection of 14 half and full-day OFAC-compliant shore excursions, where guests aboard Norwegian Sky will have the opportunity to have a farm to table dining experience, explore the flora and fauna of Soroa, see modern Havana in an American classic car and much more. During her four-day cruises to Cuba, Norwegian Sky will also call on Great Stirrup Cay, Norwegian’s private island in the Bahamas. Great Stirrup Cay is a private island paradise, with white sand beaches, crystal clear waters, watersports galore and lushly landscaped beachside cabanas for those who wish to have a more exclusive island experience. Great Stirrup Cay was recently enhanced to offer guests exciting new ways to enjoy the island with additional pathways, seating and shaded lounge areas, with additional features still to come, including a private luxury lagoon enclave for suite guests and guests of The Haven. Along with the freedom and flexibility that Norwegian Cruise Line provides, guests sailing on Norwegian Sky will also enjoy unlimited complimentary beverages as part of the ship’s all-inclusive program.